News today of interesting new research on the effect of rising sea levels on 180 US coastal cities by the century’s end. University of Arizona scientists will be publishing a paper this week in Climatic Change Letters which sees an average 9 per cent of the land within those cities threatened by 2100. The Gulf and southern Atlantic cities, Miami, New Orleans, Tampa, Fla., and Virginia Beach, Va. will be particularly hard hit, losing more than 10 per cent of their land area. The research is the first analysis of vulnerability to sea-level rise that includes every U.S. coastal city in the contiguous states with a population of 50,000 or more. It takes the latest projections that the sea will rise by about 1 metre by the end of the century at current rates of greenhouse gas emissions and thereafter by a further metre per century. The researchers examined how much land area could be affected by 1 to 6 metres of sea level rise. At 3 metres, on average more than 20 per cent of land in those cities could be affected. Nine large cities, including Boston and New York, would have more than 10 per cent of their current land area threatened. By 6 metres about one-third of the land area in U.S. coastal cities could be affected. The study has created digital maps to delineate the areas that could be affected at the various levels. The maps include all pieces of land that have a connection to the sea and exclude low-elevation areas that have no such connection. Rising seas do not just affect seafront property — water moves inland along channels, creeks, inlets and adjacent low-lying areas. “Our work should help people plan with more certainty and to make decisions about what level of sea-level rise, and by implication, what level of global warming, is acceptable to their communities and neighbours,” said one of the co-authors. An interesting notion, that of deciding how much sea level rise is acceptable. Shades of King Canute? It’s presumably the speaker’s way of pointing out that it may still be within our power to keep it manageable if we begin an urgent and drastic reduction of greenhouse gas emissions. Or perhaps he’s hinting at a time where only relocation will serve. For the present some adaptation measures are now unavoidable and should be planned for, but hopefully the digital maps of this study will help convince people that mitigation is also essential. Not seemingly the Republican majority in the House which bizarrely rampages on as if human-caused climate change isn’t happening, let alone in need of mitigation. I wonder how much similar mapping has been done in the case of New Zealand coastal cities. 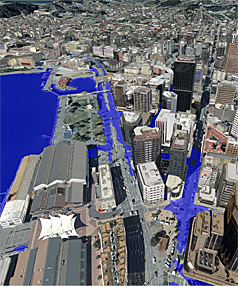 The Wellington City Council has gone so far as to consider a computer-generated graphic (pictured) which visualised the effect of a one metre rise in sea level on the city. Nelson has considered a commissioned report on climate change effects which warned that a 1 metre sea level rise would have water lapping at the airport. I don’t recall seeing anything which indicates that Auckland has seriously looked at the effect. Christchurch is planning for a 50 cm sea level rise this century with the recognition that it may be higher and presumably that means they are undertaking detailed consideration of vulnerable areas. Dunedin has had the benefit of some University of Otago modelling of a 1.5 metre sea level rise, reported here, with assurance from the new Carisbrook stadium that they’re 3.7 metres above mean sea level. I’ve written earlier on encouraging signs that local body government in New Zealand, at least in some areas, is facing up to the responsibilities for adaptation. In some cases this has meant taking on mitigation measures as an obvious consequence, though Environment Waikato’s Proposed Regional Policy Statement states that the Council’s role is to prepare for and adapt to the coming changes and that response in terms of actions to reduce climate change is primarily a central government rather than a local government role. I’ll be challenging that in my submission, since it seems to me that engaging people locally in mitigation effort is both possible and sensible, especially when they can see locally what the prospects will likely be without it. The costs of coping with sea level rise look likely to be enormous. If in fact that is what future populations have to do they will look back in wonderment on the argument represented by such as our present government that we were unable to do anything deeply serious about mitigating the effects of climate change because we thought it might affect our economy adversely. True, we might have to acknowledge, there was a Stern review which pointed out that the costs facing you, our descendants, would dwarf the adjustments required of us, but somehow we couldn’t get over our hump to reduce your mountain.